The Northern Masked Weaver was formally described by Heinrich Gottlieb Ludwig Reichenbach, a German botanist and ornithologist. Reichenbach was a prolific author and wrote a book describing many weavers known at his time. 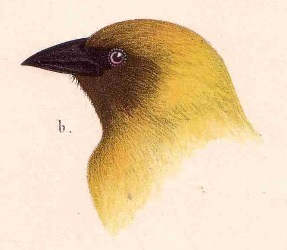 He described many new subspecies of weaver, but the only full species of weaver was the Northern Masked Weaver. Reichenbach wrote in German but provided the first English names for many species (although most of his English names are no longer in use). The Northern Masked Weaver had been collected by Gustav Boleslawski von der Trenck, a military officer. he travelled in NE Africa from 1857-1861. Major von Boleslavski sent the relatively few birds that he had collected to Pelzeln at the Museum in Vienna. He collected the Northern Masked Weaver at Gondokorro, a trading-station on the east bank of the White Nile in Southern Sudan. 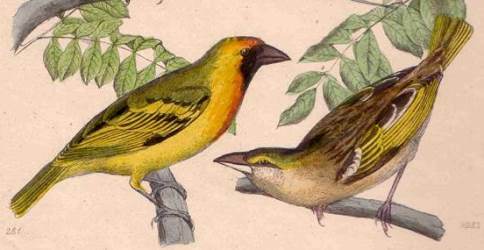 The first illustration of the Northern Masked Weaver was of a male and female, published by Reichenbach (1863). The next illustration pertaining to Northern Masked Weaver was of the head of a male by Heuglin (1871). Ploceus taeniopterus	Reichenbach 1863	SingvÃ¶gel, p.78, pl. 36, figs. 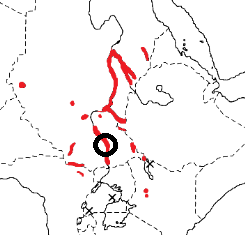 281, 282	Sudan. The banded-winged Ploceole (Reichenbach 1863). Darfur Masked Weaver, Nile Masked Weaver. The type specimen is in the Vienna Museum syntype NMW 33.998 (Schifter 2004), with a syntype SMTD-98 in Dresden Museum (Eck 2004).